The following is a partial summary of conclusions from our weekly fxempire.com analysts’ meeting in which we share thoughts and conclusions about the weekly outlook for global equities, currencies, and commodity markets. Given the quiet holiday week, we stepped back to look at some bigger picture developments. Here’s one. When the EU failed to create a real SRM deal to reform its banks, it failed to remove at least 2 potentially fatal threats. Here we illustrate and discuss them further. In Part 2 we suggest ways to protect yourself or profit from them. The implications of this chart are deeply troubling, especially in the context of the the failed SRM deal, which has made ironically left the EU less stable and more crisis prone than before, as we’ll explain below. The recent Single Resolution Mechanism (SRM) deal was supposed to break that link (aka ‘doom loop) by providing a well-funded fast acting bank resolution mechanism. 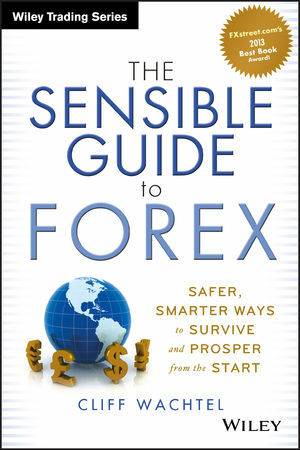 Its purpose was to quickly provide funds for cash-strapped governments to recapitalize or close those troubled banks, and thus ensure that these bank insolvencies did not cast doubt on the government’s credit rating or solvency, and so maintain the value of those sovereign bonds before lingering uncertainty lowered their value and spread the risk to everyone exposed to them, directly or indirectly. Again, maintaining those bond prices was critical, because EU sovereign bonds are too high a proportion of their total assets for many EU banks to survive a sharp depreciation of those bonds. The EU’s recent failure to agree on an SRM mechanism that is both well-funded and quick to activate means that the situation and risk level is unchanged; each member state remains left to its own (often inadequate) resources to rescue its own banks. The SRM’s common bank bailout fund won’t be available for years, if ever, can’t be accessed quickly, and is too small to maintain market calm. Not only does the new SRM deal fail to reduce the old contagion risks, it actually increased them by officially making not-so -large bank depositors, shareholders, and investors the first in line to take losses if a bank is in trouble. That policy may score points with voters and taxpayers, but it comes at a huge price – greater risks to the banking system. The new “bail-in” rules makes EU banks more susceptible to bank runs, and the collapse of their bond and stock prices if there is even a hint of trouble with them, OR any bank to which they MIGHT be exposed. In other words, the mere doubt about the stability of any systemically important bank or government could quickly spread to much of the EU as the private sector takes its money and runs. In theory the bail-ins don’t start until 2016. However we wonder if anyone with a choice will wait that long. After all, what happens if trouble suddenly emerges? With no funds available, and a potential banking system collapse, would Italy or Spain really resist following the Greek model and attempting “voluntary haircuts?” Yes, those were what started the trouble in 2012 that ultimately hit Spain and Italy, but please, one problem at a time. See here and here for full explanation, details and new risks from the failed new EU SRM deal. Note how the slope of the orange line steepens in 2012. We assume that’s because the ECB’s LTRO program offered low interest loans to buy sovereign bonds yielding higher rates and make easy profits on the difference. The result, short term gains, at the cost of yet higher proportions of total assets in EU sovereign debt, and higher exposure to any future decline in their value. GIIPS Running Out Of Bond Buyers? GIIPS governments cannot necessarily depend on their banking systems being big buyers of their bonds forever. For example, as we noted back in November here, Italian banks are already nearing saturation level unless the ECB makes it possible for them to be even more over-invested and in their local bonds, and thus more at risk if those should lose value (not exactly inconceivable in the case of the GIIPS). These governments need to sell debt. If their own banks can’t buy those bonds, who will take their place given the risks? At what cost? Remember, the SRM deal says bank bondholders are among the first in line to take losses. Here’s another chart just to supplement the one above. 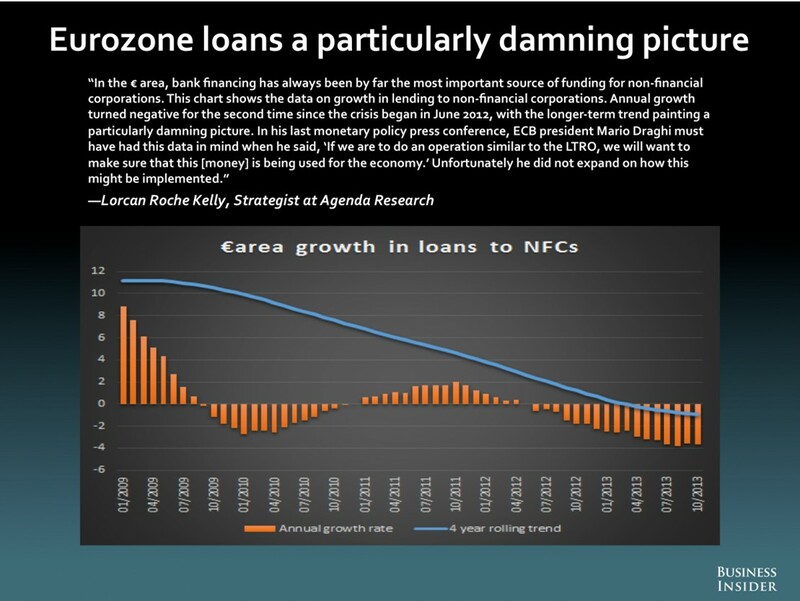 The chart below further illustrates how the decline in EU commercial lending, and its implied exacerbation of the slow growth and deflation threats, is an entrenched long term trend dating from the start of 2009. The ECB LTRO program and bank stress tests merely reinforce it. The developments noted above only reinforce this trend. In addition to those, the coming EU bank stress tests in 2014 encourage banks to hoard cash and shun lending to all but the lowest risk borrowers. Of course, now that the ECB knows there is no real SRM to prevent a panic if banks fail the stress tests, it’s unclear how it will proceed with these tests. Obviously it will not knowingly risk a panic by declaring anywhere from 70 bln euros or more of under-capitalizations without already having a means in place to prevent contagion risk and a new EU crisis. We have a pretty good idea of what ultimately happens. See our post here for details. As 2013 closed out, we saw further evidence of liquidity troubles in the EU from the ECB’s repeated recent failed bond sterilizations (bond sales to soak up cash from other bond purchases and keep the money supply from expanding). Simply put, EU banks prefer keeping their cash on hand rather than using it to buy GIIPS bonds that the ECB has bought as part of its secondary market buying program (SMP) to keep GIIPS sovereign bond prices up and yields down. 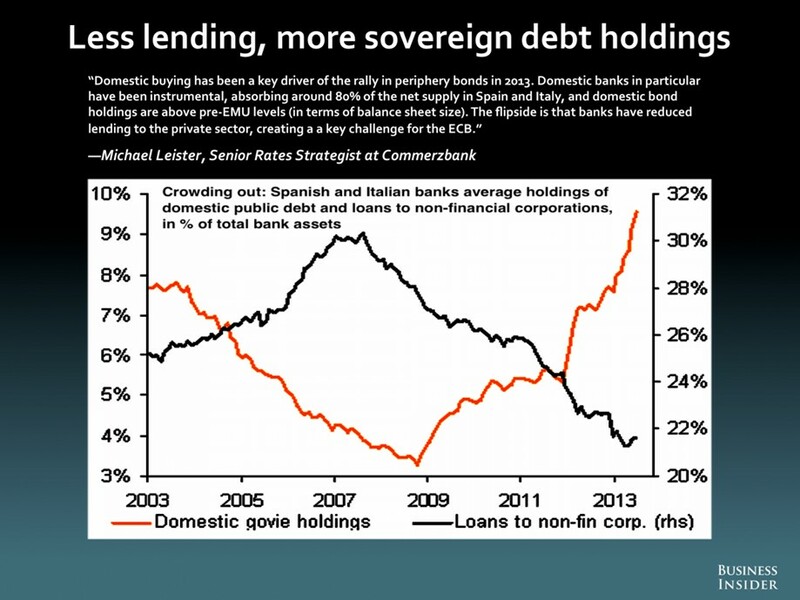 So if the ECB can’t sell enough sovereign bonds to keep the money supply from expanding, then what? Again, see our post here for what’s likely to happen and what to do about it. See Part 2 of this post for lessons, conclusions and what to do based on the above.